Bernie Sanders is a famous, successful loser. When he announced his run for the Democratic nomination in April 2015, Sanders trailed Hillary Clinton in the polls by nearly 57 percentage points. By spring of 2016, some polls showed him within single digits. Sanders was no longer an obscure senatorial frump from Vermont — he was a bona fide political phenomenon whose primary success embodied the Democratic Party’s leftward drift. But 2020 is not 2016. Sanders kicked off his 2020 run early on Tuesday, and as he navigates his second presidential primary, he’ll need to prove he can build on his past success, not coast on his 2016 coalition. Sanders enters the 2020 race not as an underdog but as a Democratic Socialist leader of the pack; an early Iowa poll showed him commanding 19 percent of the vote of likely caucusgoers, second only to former Vice President Joe Biden. Sanders comes to the race with the high name recognition that many candidates in the crowded field lack, and with a glossy pelt hanging off his political belt: the grassroots movement that propelled him to unexpected heights in 2016. While many 2020 contenders will spend the early days of their campaigns conveying just what sort of candidate they would be and delicately trying to signal what kinds of voters they think they appeal to, Sanders is already a known quantity. In a recent YouGov poll, only 16 percent of respondents said they didn’t know what they thought of him, compared with 38 percent who said the same of Kamala Harris and 29 percent who didn’t know what to think of Elizabeth Warren. Engaged Democratic voters will know that Sanders’s brand is populist — free college, $15 minimum wage, “Medicare for all” — and polemical. The senator’s early charm in 2016 seemed to lie in his harangues against an unmitigated free-market system and the need for political revolution. In the age of President Trump, many Democrats might be looking for a pure-of-heart angry warrior figure in their candidate — someone with a distinct brand of politics that hasn’t been formed solely in reaction to the president. Sanders certainly is that. We know who was attracted to that kind of candidate in the last Democratic primary. In 2016, Sanders outperformed Clinton with young voters and voters who live in more rural places. He won primaries in states with sizable white populations like Michigan and Wisconsin — states that Clinton went on to lose in the general election to Trump. In the months and years following Clinton’s loss to Trump, Democrats have debated ways to win back this disillusioned group. Sanders could hold some appeal to those Obama-Trump voters given his primary performance in upper Midwest states and the fact that he did well with independents. While Clinton won the 2016 primary by a substantial number of votes — more than 3 million — it’s safe to say the Democratic Party has gone through a bout of soul searching over the past couple of years. Voters who might have dismissed Sanders during the 2016 primary could well have come around to him in the interim. A Gallup survey found that 2016 was the first year in which Democrats felt more positively about socialism than they did about capitalism — Sanders’s message might well have seeped in. Another potential strength is his proven track record of attracting small-dollar donations. Sanders raised more than $100 million from donors giving less than $200 during the 2016 run, and in the 2020 campaign era, in which candidates are eschewing PAC money, that donor base is powerful. Sanders also may have a leg up in early primary states like Iowa and New Hampshire, where all-important local activists play an outsized role in building candidate momentum. Sanders knows them, and he won’t have to do as much as others to build up grassroots support. This means the progressive-left lane in 2020 is quite a bit more crowded than it was in 2016, which is a problem for Sanders, albeit a problem that stems from his own success. Warren is perhaps his most direct ideological competition — she’s been a critic of American capitalism for decades, though unlike Sanders, she still calls herself a capitalist and a Democrat. She also hired his 2016 Iowa caucus director — inside baseball to be sure, but it’s worth paying attention to the campaigns Democratic operatives choose to work for this early on. Another potential complexifier for Sanders is that many Democrats appear to be prioritizing “electability” over ideology in 2020. A Monmouth University poll found that 56 percent of Democrats or Democratic-leaning independents wanted a candidate who will perform well against Trump, even if they disagree with that person on most issues. What electability actually means in this context is quite vague, but if it becomes a proxy for a centrist candidate palatable to swing voters, Sanders might be out of luck. Or, even if voters decide that “electable” means more left, Sanders could lose out to new faces trying to sell their pragmatic progressivism — Harris, Warren or potential candidate Beto O’Rourke. We might be wise not to discount voters’ affinity for these new, shiny candidates: 59 percent of respondents in a recent USA Today/Suffolk University poll said they would be interested in “someone entirely new” as their nominee. Forty-one percent of those polled said Sanders shouldn’t even run again. Sanders also would need to work to improve his performance with black voters, a crucial demographic in the Democratic primary. 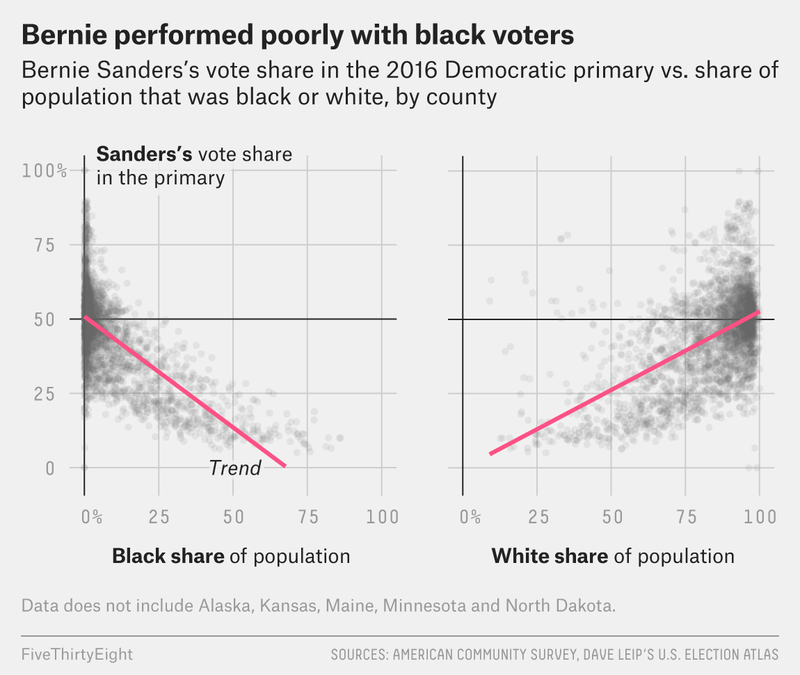 In 2016, Clinton and Sanders split the white vote, but she did better among black voters overall, though young black voters trended toward Sanders. 2020 will likely be a whole different ballgame when it comes to courting the black vote. The field has two top-tier contenders who are black — Harris and Booker — and Joe Biden could hold some appeal given that he served as vice president under Barack Obama. And then there is the matter of allegations of sexual harassment and gendered pay inequity that have been leveled against the Sanders campaign itself. Women who worked for the candidate in 2016 said there was a lack of accountability on the campaign when it came to the harassment, and Sanders’s initial response to the reporting was that he had been unaware of the allegations. “I was little bit busy running around the country trying to make the case,” he said. “If I run, we will do better next time.” Sanders issued a more full-throated apology via Twitter days later, but the allegations have served to compound the impression that there were whiffs of sexism swirling around the Sanders campaign and its supporters. “Bernie bros,” as some male supporters of Sanders came to be called, were sometimes blamed for sexist online attacks on Clinton.